The opening of the Fisher Memorial Ward, Lytham Hospital, 1901. Another important epoch in the history of the Lytham Cottage Hospital was reached on Saturday afternoon when the formal opening took place of the new ward, built to perpetuate the memory of the late Dr. Fisher. Over 600 invitations were sent out, and there was a capital response. The Lytham Volunteer Band had very becomingly offered their services, and from the lawn they played a number of selections. Hard by the front entrance to the Hospital a platform had been erected, and soon after three o'clock the proceedings were opened. The hymn “O God our help in ages past" was sung, with Mr. Lindley, A.R.C.O., at the harmonium. and the Rev. Canon Hawkins then engaged in a suitable prayer as follows :—" O Lord Jesu Christ, who, when on earth, didst heal all manner of sickness and disease amongst Thy people, we pray Thee to let Thy blessing rest on this new Ward of our Hospital. We thank Thee for the memory and example of Thy servant Luke Fisher, whose name it bears. May all who exercise their art of healing in this place and they who minister to the sick look up to Thee for help and gain from Thee skill, tenderness, and faith. Make all who suffer here submissive and patient to endure, whatever Thou shalt send, giving them a happy issue out of all their afflictions. And grant that we to whom Thou hast revealed Thy holy will may be enabled to fulfil the same and cheerfully accomplish those things that Thou would'st have done, who livest and reingest with the Father and the Holy Ghost, one God, world without end, amen." Mr. Thos. Fair, J.P., C.C., then took the chair, and at once asked Lady Drummond to open the new ward, in memory of their dear friend the late Dr. Fisher. He suggested that the committee and guests should accompany Lady Drummond through the buildings, and then presented her Ladyship with a beautiful gold key with which to open the door.
" This Ward was erected by public subscription as a token of affectionate regard and in memory of the late Luke Fisher, M.D., who for many years acted as Honorary Medical Superintendent and Honorary Secretary of this Hospital. Opened by Lady Drummond, September 21st, 1901." The tablet was executed by Cox, Sons, Buckley &Co., Henrietta-street, Covent Garden, London, and the work was greatly admired. On returning to the platform, the following honoured Lady Drummond with their support :- Mr. and Mrs. Thos. Fair, Mrs. Fisher, Revs. Canon Hawkins, J. Gilbertson, T. H. Wright, and Dr. Burton, M.A., D.D., Councillor E. W. Mellor, J.P., (Chairman of the Lytham Council), Councillor E. R. Lightwood, Mr. Wykeham Clifton, Mr. A. W. Carrington, J.P., Dr. Eason, and others. Amongst those present were Mr. Thos. Fair. ,J.P., Mr. A. W. Carrington, J.P., Dr. Eason, Mr. E. W. Mellor, J.P., Mr. J. Needham, Mr. J. S. Fair, Dr. Barlow, Mr. F. W. Broad bent and Mr. Edward Wilson, members of the committee, with Dr. Cecil Fisher, secretary, and Mr. J. Lomax (assistant secretary), Mrs. T. Fair, Mrs. and the Misses Carrington, Mrs. Eason, Mrs, Mellor, Mr. and Miss Needham, Mrs. Barlow, Mrs. Wilson, Revs. Canon Hawkins, J. Gilbert- ,son, T. H. Wright, W. H. .Johnson, B.A. (St. rAnne's), and Dr. Burton, B.A., D.D. (the new Superintendent of the Wesleyan circuit), with Miss Threlfall, Mrs. Gilbertson, Mrs. Wright. and Miss Burton, Mr. A. Wykeham Clifton, Mr., (Mrs., and Miss Fullagar (St. Anne's), Councillor E. R. Lightwood, B.A., and Mrs. Lightwood, Councillor and Mrs. Ainscough, Councillor Ashworth, Dr. Fernhead, Mrs. Fisher, the Misses :Fisher (Lancaster, sisters of the late Dr. Fisher), Mrs. Outran. the Misses Halket, Mr. T. A. Dean, Mr. Broadbent, Mrs. Talbot Fair, Mrs. Pemberton, Mr. W. Kay, Mr, F. Harrison, Mr. Lindley, Mrs. and Miss Thompson (St. Anne's), Mrs. and Miss Edleston, Miss Birley, Mr. and Mrs. Taylor, Miss Foster, Miss Peel (matron of the Blackpool Hospital), and Miss Sellers (matron of the Lytham Hospital). Mr. Fair, the Chairman, then announced the receipt of letters and telegrams of apology and congratulation. Canon Taylor had sent a kind letter in which he said : "I have your letter about next Saturday's opening ceremonial. I wish I could have attended. The event is of interest because of the object and the name of him in whose honour the addition is made. I am so lame and incapable that I must forego the pleasure. I wish you every success. Mrs. 0' Neill (a daughter of the late Dr. Fisher) telegraphed: “Am with you all in spirit. All wishes and hopes for a most successful day." Major Hincksman telegraphed from Buxton : Sorry we cannot be with you to-day." And from Buntingford, Christine Fisher had wired: " Wishing you every success to-day and always." At this juncture a most charming little incident occurred. Confidently, but yet with true maidenly modesty, little Miss Broadbent, a grand-daughter of the late Dr. Fisher, made her way to the platform and presented Lady Drummond with a magnificent bouquet of white roses, and lilies of the valley. Her ladyship acknowledged the gift by kissing the bonny little donor. From the same hands Mrs. Fair also received a bouquet of pink roses and lilies of the valley. The bouquets were from Mrs. Maries, Clifton-square, and were of beautiful design. The Rev. Canon Hawkins proposed a vote of thanks to Lady Drummond. They all most heartily welcomed Lady Drummond whenever she came to Lytham, and none welcomed her more heartily than they who knew her best and who best remembered her. (Hear, hear). 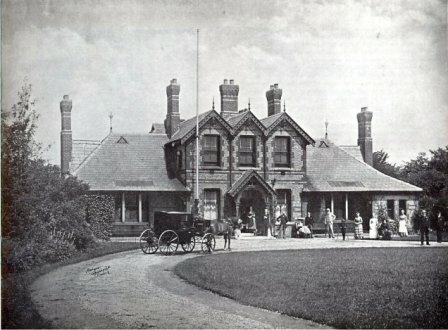 He felt that there could be no more appropriate occasion on which Lady Drummond could come before the people of Lytham than the occasion on which they were met that afternoon, for they always thought of the Lytham -Cottage Hospital as connected with the family of the Cliftons. (Hear, hear). He had power to look back for one and thirty years at Lytham, and he recalled well an afternoon in the year 1870 when he was asked to perform that very office he had that afternoon performed of offering prayer on the occasion of the first opening of the Lytham Cottage Hospital. It had been built as a gift to the town from and by the munificence of the Clifton family, and the lady who opened it on that occasion was the Lady Eleanor Cecily Clifton. Councillor E. W. Mellor, J. P., seconded in a beautiful speech. He was one of those who knew Dr. Fisher personally ; he was one of also, and perhaps many of those present were, who had seen him in the sick room, who had noted how he smoothed the pillow to the weary, aching head, noticed the quiet cheery words that brought the smile to the enfeebled lips, and when-the sick chamber 'became the chamber of death he had experienced their late friend's feelings of tenderness and felt that one's own bleeding wounds became his, Such recollections became living memories, and he therefore esteemed it a privilege to be identified with, the ceremonial that afternoon, and he was sure that the gracious act which Lady Drummond had just performed would live for ever in the annals of the Lytham Cottage Hospital. If the late Dr. Fisher could have suggested a memorial to himself, it would have been something that would have tended to relieve suffering and distress, and this new ward was eminently calculated to do that. (Applause). The new ward and the hospital could not be maintained in its full efficiency and do the work Dr. Fisher would have liked to see it do without a generous response from everybody all round. The fact that they had only about 140 annual subscribers was something of which they ought to be a little bit ashamed, considering the population of Lytham and St. Anne's. All honour to those who did subscribe. He could not say that to those who did not, and he hoped a word in season would enlarge the scope of the hospital's efficiency. (Applause). The resolution having been put and carried, Lady Drummond said :--" I am very glad the Committee have asked me to open the Luke Fisher Ward of the Cottage Hospital I should have been extremely sorry to miss so interesting an occasion, for Dr. Fisher was a very good and kind friend to me and though everyone here is his friend, no one can feel more gratefully affectionately towards him than I do, as besides our long friendship, he, humanly speaking, saved my life. This memorial is so very appropriate ; the Cottage Hospital was very near his heart, and when I came to Lytham, 34 years ago this month; he was then already deeply interested in the idea of it, and gave it his time and care most ungrudgingly, as he did everything and everyone who wanted it. When I lived at Lytham and went about a good deal, I heard on all sides of his kindness to the sick. I remember one old woman who lived near Hallam telling me that when she was ill with a very bad fever and her neighbours were afraid to come and nurse her Dr, Fisher came every day added "He was a mother to me-" It is very pleasant to think that when we also have gone the way of all men, Dr. Fisher's memory will not be forgotten, and that the wing of the Cottage Hospital and the Luke Fisher Ward will remain as a memorial of his useful life, and I hope, be of help and comfort to many." Mr. Needham proposed a vote of thanks to Mr. Fair for the important part he had taken in the interesting proceedings they had witnessed. On behalf of the members of the Hospital Committee, he also wished to say how very greatly indebted they were to Mr. Fair for the assistance he had given in preparing for that day, and especially did he deserve their thanks for having conveyed the invitation from the Committee to Lady Drummond. 'the whole of the inhabitants of Lytham and the district who had claims en the benefits and privileges of that Institution, were greatly indebted to Mr. Fair, for he had been associated with it ever since its inception in 1871, and during the whole of that time his influence had been exerted and ins support given in furthering the human and beneficent purposes for which the hospital was built and established thirty years ago. The extension of the hospital would increase its usefulness, and it would also increase its responsibilities and add to the labours of the medical staff. But whist the medical staff would be quite willing to continue their labours as they had done hitherto, and the patients would get the benefit of their skill and advice, yet, on the other hand, the Committee would not be able to carry on the duties of the hospital unless they found a greater amount of support from the district. The institution was not endowed, and the amount of -money received from invested funds was only four per cent of the expenditure. What was wanted was a larger number of annual subscribers. (Hear, hear.) The Committee had repeatedly to come before the public for help, but if they got more regular subscribers they would be able to do without. They very cordially acknowledged the generous liberality displayed to them of late, and the money would be well spent. Those who had seen the new ward and the hospital as a whole, would feel that the money had not been wasted. The new ward was a credit to all concerned in its erection. Dr. Eason, in seconding, said it seemed to him that the words uttered from that platform were echoes of past Lytham, when they had their old friend Dr, Fisher spoken of in such terms of endearment, and when they had with them Lady Drummond, the Lady Bountiful of the old days —(hear, hear)—and Mr. Fair, who for so many years had taken such a great interest in Lytham. In the old days, these three individuals were absolutely necessary for the carrying on of every social work in the district. When in any sort of difficulty they went to Mrs. Clifton, and she referred them to Mr. Fair, and he used to tell them to get the assistance of Dr. Fisher. When they had the three interested in any movement they knew that success was assured. Now the only link between that time and the present was Mr. Fair, and he was trying to get clear of his responsibilities, but they called him from his rural retreat, and he did not seem to mind. Mr. Fair was so invaluable to the hospital that they could not do without his services. He hoped the t institution might long be upheld to carry out the beneficent intentions of its founder. The resolution having been carried with. applause. Mr. Fair responded. He hoped that he might be able to work for the hospital some years longer. (Hear, hear). As Canon Hawkins said, it was peculiarly appropriate that they should have the presence of Lady Drummond, for undoubtedly the inception of this Cottage Hospital rested with her and Dr. Fisher in a great measure, not forgetting one who was there before him (the speaker), his father. (Applause). The establishment of a hospital had been talked about for some time by Dr. Fisher, but in 1869, whilst Mr. and Mrs. Clifton were residing at Lytham Hall for the autumn, there was unfortunately a slight outbreak of low fever in Lytham, and this brought the proposal to a head. Fortunately such timings didn't occur in the well-regulated Lytham of to-day. The idea was at once taken up. Lady Drummond brought it before Colonel and Mrs. Clifton, and Colonel Clifton, with that great generosity of heart almost peculiar to himself, undertook to give a site and put up a building and also to furnish it. The late Dr Holland, who had the care of some of the most important buildings in Lancashire, gave them a sketch of that little building, and it was put into the hands of Mr. Littler, the county architect, to prepare plans. The foundation stone was laid by that lady, Cecily Clifton, on September 2nd, 1870, and it was opened on the 3rd of August, 1871. Since that time he (the speaker) had been on the committee, and had been more or less connected with its work. He recalled the names of Mr. Greenwood and Mr. Richards and others who had also ice closely and actively associated, and also the name of Mrs. St. Clair, their first matron, who came from St. George's Hospital. Miss Sellers would not be jealous if he said they might since have matrons as good, but they never had a better than Mrs. St. Clair. Sometimes they were told the hospital had not done as much good as it ought to have done. Since the hospital was opened, 2,119 patients had passed through the hospital, and more than half of these had been treated during the last ten years. The highest number admitted in any one year was 158 in the year 1899. The hospital now, as they saw it that day, 'would accommodate 25 patients. The terms of the hospital were most reasonable, the very poor being especially considered. The latter were admitted at 3s.6d. per week, or sixpence a day, and the others, according to their means," at the moderate sum of 12s.6d. If an outbreak of illness occurred among the domestic servants of a large household, these could he boarded, lodged, and skilfully attended for 10s.6d. per-week. As to, the necessity of greater help and larger funds he should not venture upon any special pleading on that occasion, but he did beg of them that when they were considering the disposal of surplus capital they would remember the claims of the Cottage Hospital. He was glad to be able to announce & perfectly voluntary subscription from Lady Drummond, who wished to be put down as an annual subscriber for £5. (Hear, hear, and applause). Mr. Fair also referred to a falling off in collections from the churches. In 1877 they received £68 4s.5d. from this source. Last year, it was only £28 3s.11d., less than 25 years ago, though the hospital was doing a much larger work. The friends at St. Anne's had entirely forgotten that the hospital had any claim upon them. He hoped that St. Anne's would remember that funds were very touch needed, and that it would be borne irk mind that one-fifth of the patients who passed through the hospital last year were from St. Anne's. Mr. Fair announced that the following gifts had been made to the Luke Fisher Ward :Five bedsteads by Mr. G. R. Bellamy ; two bedsteads, bedding, and four pairs of blankets from Mr. Rhodes ; six pairs of blankets from Mrs. and Miss Rhodes ; a clock and five quilts from Miss J. C. Halket; fireirons and hearthrug, Mrs. Needham ; screen, Mrs. Thompson (Fairhaven): arm chair, Mrs. Fisher; picture, Mrs. O'Neill and Mrs. Broadbent. Mr. Fair also thanked all the friends who assisted at the bazaar last year and at the hospital fete this year, and likewise others who had made gifts for the furnishing of the hospital. It was also his duty to express their very deep gratitude to the medical staff. (Hear, hear). Mr, Fair announced that the necessary documents were being prepared for handing over the site and buildings by Mr. Clifton to the town. Perhaps the medical staff were ambitious for an operating theatre, but practically the building was now finished. He had hoped they might have been able to hand it over to the town perfectly free from debt. As far as the building went he thought they were free, but there was often a skeleton in the cupboard. The Urban Council have sent in a bill for street paving for £150 odd. If they could get the Council to soften their hearts and forego that amount, he did not think it likely they would be put into jail. The Council he believed were advised that they could not allow this, but the allowance would not be to an individual but to a building, which was being made over to the public. Doctors differed, and so he supposed did lawyers. He was advised by an eminent Town Clerk that the Urban Council could allow the amount with perfect safety, and he felt every confidence that their friend Mr. Mellor, the Chairman of the Council would do his best for them. He had in his hand one of the hospital annual reports fur 1877, which contained the following par. 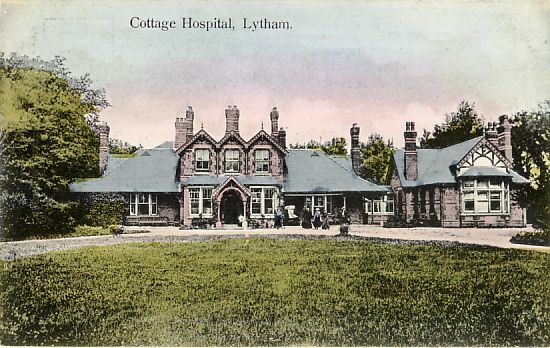 :—" Arrangements for opening a sanatorium for the reception of infectious cases, have been made by the local Commissioners, and there can be no doubt whatever that when fully completed it will confer a great boon on the town of Lytham, and be very gratefully accepted by the public." if they could do that 25 years ago, he hoped they might be able to make them the present allowance without being surcharged. In conclusion he expressed his deep thanks to Lady Drummond. She had come, at great inconvenience owing to a slight accident to her son. The Chairman invited those present to partake of afternoon tea, and the function closed, the band playing several selections whilst tea was being served. The committee, had very generously provided this acceptable item out of their own pocket, and Rymer's, confectioners, of Clifton-street had been entrusted with the task. That they did their work satisfactorily may be gathered from the fact that Lady Drummond and many others expressed the appreciation that all no doubt, felt. After the guests had departed, the patients who had been permitted to watch the ceremony were served with tea, and a most enjoyable party was then concluded. It should be stated that Mr. Bellamy, the indefatigable hon. treasurer to the Hospital, was all the South of England on Saturday, and was therefore unable to be present.